The Persians are as famous for their gentle and placid nature as for their beautiful longhaired coats. 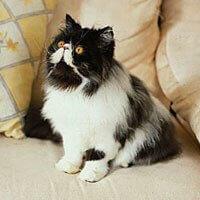 One of the most popular registered breeds in Australia the Persian has appeared in cat shows for more than 100 years. With a huge variety of colours and coat patterns available which includes chocolate, blue, black, tortioseshell, lilac, cream, smoke and tabby the Persian is particularly suited to indoor living which can help keep their coat in peak condition. Persians are quiet and affectionate cats, adaptable to any environment, but dislike being teased so are probably more suitable to an adult household or one with quiet, gentle children. People considering owning a Persian must be prepared to spend time grooming their cat's beautiful coat daily. This is a very high maintenance breed which relies on its owner for its comfort and wellbeing. If grooming is neglected the coat will mat which requires expert attention to rectify. Persians moult heavily twice a year, but shed hair all year round.